First, thank you all for the birthday wishes. The Excellence Office got together and took me out to lunch, where I enjoyed my favorite foods like tuna, salmon, and milk. Delicious! They also bought me catnip and crunchy treats as gifts. It was a wonderful day. Speaking of wonderful days, everyone in Excellence was thrilled to be a part of the 4th annual National Pro Wrestling Day (NPWD) on February 6th! The positive power of pro-wrestling was evident that day, as we exceeded our $2,400 goal for The Polaris Project. Thank you again to CHIKARA’s Director of Fun Mike Quackenbush and all our friends at CHIKARA Pro for including us! I am very proud of everyone who was there in Reading, PA! Thank you for representing us so well! While he didn’t win, Team Akuma’s Ca$hflow Ken Broadway put on a good performance in CHIKARA’s Young Lions Cup XII tournament and the quartet of Havoc, Danger Jameson, Marq Quen, and Sasha Jenkins tore down the house in a tag match! Vanity escorted the “new and improved” Chuck TaylorTM as he made his “debut”! Nick the Silent Assassin and Tim Taylor greeted fans at the Excellence table! CHIKARA is taking pre-orders for NPWD ’16 right now! Purchase the event for only $9.99 right here! Our next event will be March 12th, when we will present “Kittens Mittens”! We will be back at our home in the Forrest Lodge in Sellersville, PA for the first time in 2016! Since the start of Excellence, my office received numerous requests to bring The Batiri (Obariyon and Kodama) here! At “20% Gratuity”, I signed them to a match with One Night Only (Marq Quen and Anthony Gangone)! They had an excellent contest, which you can watch on our YouTube channel. Since then, the fans have been begging me to bring them back. I love our fans, and want to give them what they want! So at “Kittens Mittens”, The Batiri will return to EPW and wrestle ONO again in the main event! ONO was victorious in their first encounter against the more experienced duo. But can they continue their winning streak and defeat the devilish demons one more time? I also signed a tag team match between Danger and Rembrandt Lewis and Smiley and Nick, accompanied by Ariela Nyx! Smiley and Nick teamed up back in the Summer of 2014, but Danger and Lewis have more experience. And if they win, they might just get that coffee with Icarus after all. “The Nightmare Warrior” Hallowicked, “Winged Ring Warrior” Icarus, The Boar of Moldova, “Lady Excellence” Deonna Purrazzo, the “O.G. Doll” Vanity, Gran Akuma, and “Life Champion” Dan Champion will also be there! Karen Q .will make her debut and “Freshly Squeezed” Orange Cassidy will return to EPW after a brief absence! I will be announcing more matches as we approach “Kittens Mittens”. Plus, I’ve tasked my Administrative Assistant Babs to work on a special project which we’ll reveal at the event too! Don’t forget to friend me on Facebook. I promise not to bring you bad luck! Also, visit our website for more updates and missives from me, Edgar Excellence, the Head Cat of Excellence! If you love EPW, we have a Facebook Page and Twitter, so be sure to like and follow us. We also have a YouTube Channel featuring footage from our last event, “20% Gratuity”, “Excellence Live”, 5 Minute Matches, and videos featuring the stars of EPW. Winter storm Jonas lived up to the hype and we had to cancel “Let The Cat Out Of The Bag”. I want to apologize to all you dedicated Excellence Pro (EPW) fans. We hate canceling events as we love putting on the best professional wrestling for you. But last month, we couldn’t guarantee everyone’s safety due to the blizzard conditions. Plus, I didn’t want to get my paws wet. I hate snow! Instead, we presented some great EPW matches for everyone to curl up and enjoy with a cup of hot cocoa and lots of marshmallows (or just milk)! First, we started with tag team action when Too Many Cooks (Assistant Chef Smooth Blackmon & Sloppy Joe) took on The Punk Rock All Stars (Drake Carter and Shaun Cannon) during “Pork Chops” on 6/13/15. Next, the ladies were center stage when “Lady Excellence” Deonna Purrazzo wrestled Tessa Blanchard at “Tiramisu” on September 12th. 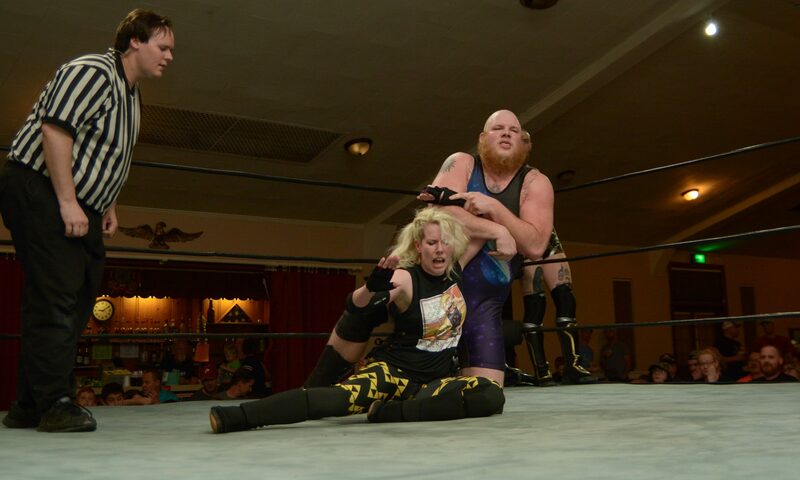 From “Turducken” on July 11th, we shared the third match in a “Best of Three Series” between One Night Only (Marq Quen & Anthony Gangone) and The Osirian Portal (Amasis & Ophidian). The action continued with a trios match from “Eclipse” on October 11th, 2014, when Blind Rage, Icarus, and Hallowicked united and battled Dan Champion, Gran Akuma, and Oleg the Usurper. Our Snow Day presentation ended with King Ricochet facing our own “Friendly Neighborhood Psychopath” Smiley in the main event of “Tiramisu”. All our Snow Day videos are still available on our YouTube page! As previously announced, Excellence will be a part of the 4th annual National Pro Wrestling Day (NPWD) at the Goodwill Beneficial Association in Reading, PA! We missed all of you last month and hope you’ll join us this Saturday at 2 pm for the yearly celebration of pro-wrestling! For more information on this year’s event, visit the website. NPWD is free to the public, but donations will be accepted for this year’s charity, The Polaris Project. Recognized as a “Four Star Charity” by Charity Navigator, The Polaris Project helps fight human trafficking, which is a world-wide and domestic epidemic. According to their website, trafficking victims are at the center of their work. They strive to help survivors regain their freedom, prevent more victims, and pursue and stop traffickers wherever they operate. You can donate in person at NPWD or online through this link. Please help us meet our goal of $2,400! We can do it! I am very proud that EPW will be a part of this event. We believe in the positive power of pro-wrestling and the difference we can make together! Thank you to CHIKARA’s Director of Fun Mike Quackenbush and all our friends at CHIKARA Pro for including us! At NPWD, Team Akuma’s Ca$hflow Ken Broadway will be representing us in CHIKARA’s Young Lions Cup XII tournament! He will join 12 other hungry young wrestlers competing for the shiny golden cup. Plus, we will present a tag team match. The unlikely duo of destructive newcomer Havoc and our fearless stuntman extraordinaire Danger Jameson will team up to take on undefeated One Night Only! Looking ahead, we will be back home at the Forrest Lodge in March. On March 12th, we will present “Kittens Mittens”. Hopefully we’re not jinxing ourselves with more snow with the mitten mention! I am a black cat after all. The very first match has been announced and it’s a rematch from “20% Gratuity”! Those lovable and devilish demons, The Batiri (Obariyon & Kodama), will return to EPW to take on One Night Only with the goal of ending their streak! Don’t forget to friend me on Facebook. I promise not to bite or scratch…well, not too much! Also, add our site to your bookmarks for more updates and missives from me, Edgar Excellence, the Head Cat of Excellence! If you love EPW, we have a Facebook page and Twitter, so be sure to like and follow us. We also have a YouTube Channel featuring footage from “20% Gratuity”, “Excellence Live”, 5 Minute Matches, and videos featuring the stars of Excellence Pro. See you this Saturday in Reading for National Pro Wrestling Day!